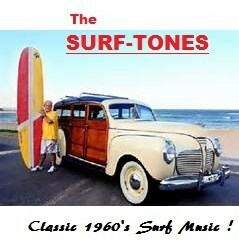 Kids' Party Entertainments > "The SURF TONES"
thrilling evening of nostalgia that will bring you back to when fun beach music was so great. This instrumental group consists of guys who have literally been playing these tunes since they first came out in the early 1960's--and they sound just like the original artists!! Great entertainment, and good clean fun for the entire family! Please note "The SURF TONES" will also travel to Wrightsville Beach, Carolina Beach, Winnabow, Leland, Kure Beach, Castle Hayne, Southport, Bolivia, Delco, Rocky Point, Oak Island, Hampstead, Currie, Riegelwood, Supply, Bolton, Burgaw, Ingold, Brunswick, Atkinson, Pine Level, Kelly, Holly Ridge, Shallotte, Watha, Maple Hill, Dublin, Council, Ash, Ocean Isle Beach.